I have just returned from a three-day tour of the West Bank and east Jerusalem, organised by the pro-Israel, pro-peace organisation, Yachad. The participants were all passionate Zionists and, were it not for some grey hairs and wrinkles, we could have been a youth group. In fact, we were all senior lawyers or individuals with a particular interest in the rule of law. The purpose: to understand the legal context to the occupation. The centrepiece, a unique visit to the IDF military courts that maintain law and order (for Palestinians only) in the West Bank, unique in that we were the first organised group of British Jews to visit the courts. In the course of the tour we met a very broad spectrum of people from representatives of Israeli NGOs, a senior employee of the Yesha Council, which represents settlers, and a senior adviser to Foreign Minister Avigdor Lieberman. My conclusions? First, there is no substitute for finding out what is really happening on the ground by visiting and asking difficult questions. I had made numerous assumptions from both Jewish and non-Jewish media, which were simply wrong. Secondly, those who consider that stories of systemic breaches of human rights under the occupation are an anti-Israel myth are deluding themselves. We spent a morning at the military courts observing young Palestinian boys, aged 13-17, being processed, and speaking to their mothers. It is clear that children are invariably arrested in night raids by the army at gunpoint, cuffed and blindfolded and held, often for hours, in that condition, denied access to food, water and toilet facilities, interrogated without being advised of their rights, without a lawyer and without their parents. Military Court Watch, an Israeli NGO, has carried out a detailed forensic review and they found over 50 per cent of children were arrested in night raids and 83 per cent of children blindfolded. All of the children we saw in court were in leg shackles. There was a shocking passivity of the Palestinians we observed at court. Parents and detained children smiled and joked with each other and we did not see a single case of anger. That’s not to say parents did not care that their children were being imprisoned. But conviction rates are 99.7 per cent. The passivity bespeaks a people who have become resigned to their reality. They recognise there is no longer any point in fighting for basic rights. I felt that the court system was clearly a figleaf for a system of arbitrary justice where the guilt of the child is beside the point. The courts are part of a system that effectively keeps Palestinian society in a state of constant fear and uncertainty. So why do the authorities bother with the expense of maintaining the pretence of justice? The answer is that without scrutiny it is possible to pretend that the system is fair. So, defendants are legally represented and proper rules of evidence apply. 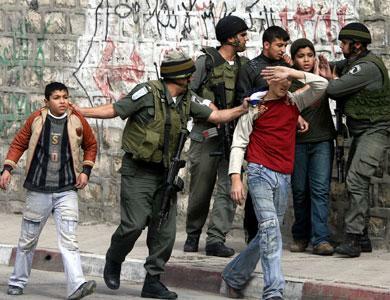 Arrest of boy, Silwan, 2011. No further information. A much reproduced photo, for obvious reasons of a police swoop on young boys in Jerusalem, 2010. No further information. Scrape away the veneer, and the charade is exposed with convictions routinely obtained based upon forced confessions and defendants facing remand without bail pending trial for periods in excess of sentences when pleading guilty. No sane defendant would plead not guilty in this Catch 22 situation. I would argue that diaspora Jews who are true friends of Israel have a duty to visit the territories to understand the problem, and then to lobby friends in Israel to strive for a just end to this situation. If we do nothing, can we complain if we awake one day and Israel has sleepwalked into the status of a pariah country?